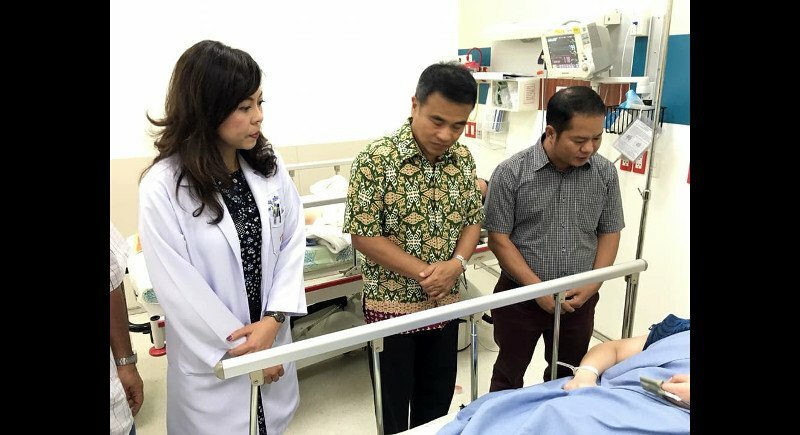 PHUKET: Doctors have played down fears that 26-year-old Chinese tourist Kwang Pei Hong, who remains in the intensive care unit (ICU) at Vachira Phuket Hospital, will need to undergo facial cosmetic surgery for burns sustained in the tour boat fireball off Phi Phi Island on Sunday (Jan 14). Ms Kwang suffered extensive burns to her face, arms and both legs – with burns to more than 30% of her body – in the fire. However, she is conscious and can speak, but still in pain, said the MoTS report. “She keeps urging doctors to help ease the pain, and has asked doctors will her face be the same,” the report added. However, the report noted that doctors responded that “her face remains the same” – but were not yet ready to clearly rule out the future need for facial surgery for the 26-year-old. Regardless, Ms Kwang remains in good spirits and thanked everyone for their visits and best wishes, the report noted. Of the eight tourists are still recovering at Bangkok Hospital Phuket, 63-year-old Mei Hua Li and Gan Li Xia, 26, remain in the ICU. Ms Mei , 63, who also suffered burns to both her legs and arms as well as her face, is conscious but still on assisted breathing after her lungs suffered damage from smoke inhalation. “She is feeling better and doctors clean her wounds in the operation room to prevent infection,” the MoTS report noted. Ms Gan, who suffered burns to more than 30% of her body, is also still on assisted breathing. Of the remaining six patients, Di Di Yin, 23, was discharged from hospital care this morning. As of yesterday Ms Di continued to experience rapid breathing and was unable to move her hand due to a strain injury. She also remained numb on her wounds to her feet, but “doctors say she feeling better and her wounds are starting to look better”, said the MoTS. Wen Qing Wei, 27, with second-degree burns on both feet and ankles, is also improving. Her chest pains have subsided and a chest X-ray showed no complications, said the report. Tingting Sun, 36 (named by Phuket Tourist Police as Sun Tingting, 37), who suffered wounds to her right leg, hip and experienced leg pain, is recovering and examinations have determined no spinal damage. Her treatment is now under advisement by a specialist, noted the MoTS in its report. Wu Yan, 36, with back pain and wounds to the front of her legs sustained is no longer in pain and can walk, while Taiwei Wang, 28, who suffered first-degree burns to his arms and legs, is also recovering well, reported the Phuket Tourist Police. Similarly, Xin Zhang 28, who suffered minor burns to her right ankle is no longer in pain and can walk, the Phuket Tourist Police noted. Meanwhile, across town at the Phuket Provincial Hospital in Rassada, speedboat crewman Prawat Sengviman, 45, who suffered burns to his face and both arms, is also recovering. “He is conscious and can sit up and talk,” reported the Phuket Tourist Police. As of this morning the Phuket office of the Department of Marine and Coastal Resources (DMCR) confirmed it is assisting in the investigation into the boat fire. Governor Norraphat yesterday estimated that Phuket serves some 20,000 to 30,000 marine tourists a day. As noted in another post, PN commenters apparently feel that compassion is "nonsense". Uniformed hatefulness seems to be preferred. Sad. Can't find any reference to money in the article only the compassion being shown by the Phuket Governor in visiting the injured. to Phuket.You giva a Ch..t about tourist in Phuket.